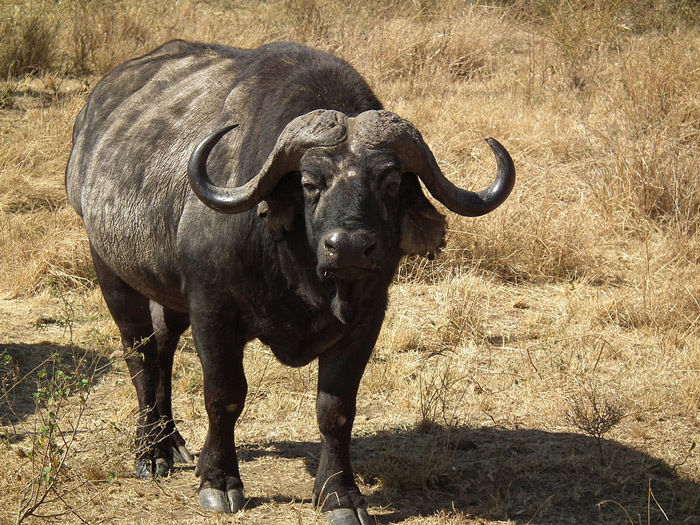 RUKUNGIRI- Three residents of Bugangari Sub County in Rukungiri district are nursing injuries after being attacked and injured by a buffalo that had escaped from Queen Elizabeth national park on Tuesday. Kahubire Rwatabire from Katabushera, Asta Busingye of Nyabitete Parish in Bugangari Sub County and an unidentified child aged about 6 are currently admitted in hospital following the Buffalo’s attack. Rwatabile and the child are admitted at Nyakibale hospital in Rukungiri while Busingye is at Bugangari health centre IV. The Bugangari sub county Chairperson, Domiano Kijaguzo told PML Daily that more eight locals are also nursing minor injuries. He says that the buffalo left the park during the night and reached Bugangari trading centre at around 8am. Residents reportedly started pelting stones at it, and chased it all the way to Kagashe cell in Katabushera, where it became hostile, turning against them thus injuring some. Kijaguzo says the locals who were armed with spears, machetes and stones later overpowered and killed the animal. These, he says, slaughtered it and shared the meat before police could arrive in the area. Kijaguzo says the buffalo travelled about 20km from the park probably in search for food, due to the prolonged drought in the area. Moses Nanoka, the Rukungiri District Police Commander, said they got information when the residents had already slaughtered and shared the meat.